This entry was posted on Wednesday, January 7th, 2015 by Frances Ryan. What’s a penny worth to you? Is it worth stopping what you’re doing so that you can bend over and pick it up? What if I told you that one penny could make a real difference in someone’s life? OK, maybe that one penny won’t make a difference. I mean, you can’t even buy penny candies for a penny these days! But those pennies add up to more. A lot more. And, as you may know by now, I do love stopping to scoop up pennies—and other random things. After all, I am well-aware that the overall rate of return is £18-36 ($18-36) per hour. Most years, I find less than £30 and I use it to treat myself to something pretty; something frivolous; something I absolutely don’t need—but I want. But once I realised I was set to find a lot more than normal, I decided I would donate half of my findings to a good cause. After all, my happy finds should benefit more than just me. But then I realised something: I realised that I am a very lucky woman who doesn’t actually need a special treat. Especially when I know that special treats often make me feel guilty because there are others out there who don’t have the means for a warm meal, let alone a pair of pretty earrings (of which I have dozens!). And despite my finances being rather meagre at the moment because I’ve decided to study for my PhD, I don’t have to worry about homelessness or hunger because a friend has given me a spare room which means I can afford to eat and to clothe myself (as long as I shop at charity shops and accept hand-me-downs). I know that I am blessed with a strong support network who will help to ensure I am always safe and warm—and fed and clothed—no matter what. But sadly, there are thousands of people in my community who can’t say those things. There are so many people who find themselves sleeping rough or going hungry—or both. There are so many people who have unsafe or unstable housing; people who have to choose between shelter and food; people who don’t have family and friends looking out for them. So that’s where my 2014 found money went—all of it, plus a little more from my own money: To those in greater need than me, by way of the Bethany Christian Trust—a homeless support organisation I’ve raised money for in the past. I know it’s not much, but it’s something. And hopefully, it’s a little something that will help to make someone’s life—or at least day—a little brighter and maybe a little safer. 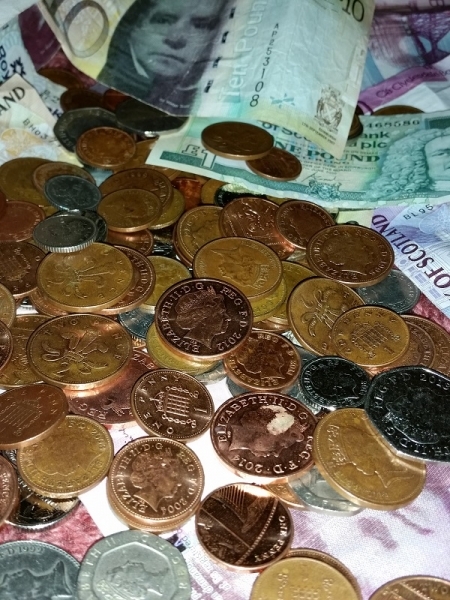 As for my 2015 haul, I’ve already added 20p to the pot. I don’t expect another £60+ year, but every penny counts and I’ll be sure to make sure that they go to another good cause at the end of the year. After all, I find an extreme amount of simple pleasure in just finding the money, and if passing it on to a better, more worthy cause at the end of the year can benefit someone else, then each of those little pennies have seen their value double or triple!